4 months, 123 pictures, and 20,000 views! JoggingJeans.com was started just over four months ago as a JOKE – a joke between me and my dear husband. Today, the same week of the four month anniversary, JoggingJeans.com received its 20,000th view. 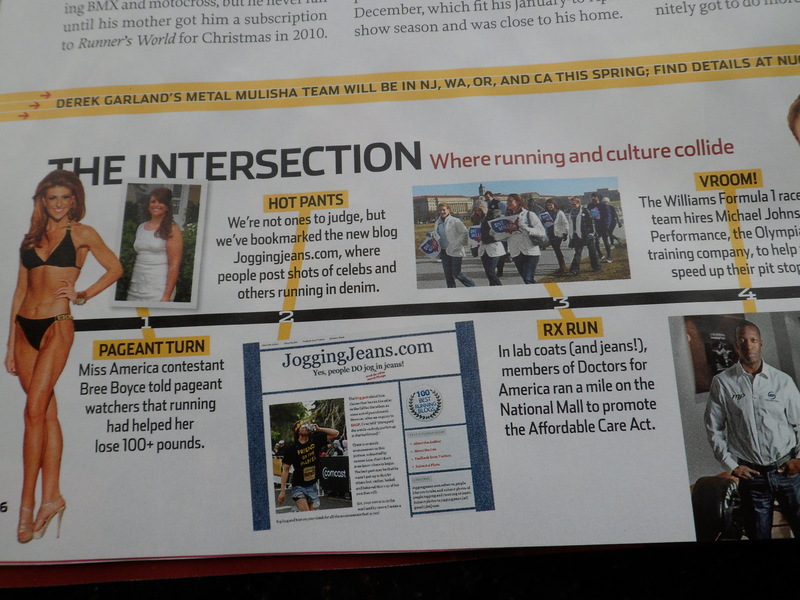 20,000 times someone has wanted look at pictures of people jogging and exercising…IN JEANS! He did WHAT in jeans? No need to stage an intervention YET. A jort-themed 5K! A jort-themed 5K! A runner IN JEANS and IN HEELS! Race number, check. Running shoes, check. Purple sparkly leotard, check. Jeans, check. Running in a denim jacket ← a favorite only because of the BEAUTIFUL man in the photo. Hubba-hubba. My husband and I were waiting for the start of a Pittsburgh 5K that started on the Clemente bridge (I think it was the Pittsburgh Charities 5K Home Run). There was a guy in front of us, stretching and looking as if he was preparing to run IN JEANS. We said to each other, “What the heck! ?” and “He HAS to be here just waiting for the start of a race with a ‘real’ runner, right?” When they guy turned around and we saw the race number pinned to his shirt, we started laughing. I said, “I wish I had a camera.” My husband said, “That would be a good idea for a website – people could send in pictures of people running in jeans.” A few months later, I pulled some pictures off the web and started it just a joke between the two of us. The next thing I know people were submitting photos, Runner’s World was linking to it, and here we are 20,000+ views later. Jeans and khakis at The Color Run in Dallas! Congrats! What a great accomplishment! I look forward to many more photos to start my mornings! So well deserved. Your blog is forever bringing me chuckles!